High crop yields require good nutrients, and the amount of nutrients delivered (like phosphate and nitrogen) can also make a big difference in crop yield. Nutrients can be added in different ways, one includes using a treated peat with the crop seed. 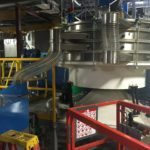 The peat processing system can be fully automated from the introduction of raw unprocessed peat, through adding enzymes and other ingredients necessary to nutrient delivery, to bagging for delivery to the end customer. 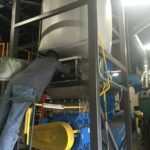 Sterling Systems & Controls, Inc. has provided completed peat processing systems from start-to-finish. Dry peat, brought in bulk bags, is unloaded into the primary surge hopper via Sterling Systems & Controls bulk bag unloading and conveying equipment. Out of the primary surge hopper, dry peat is introduced into the Upper Continuous Blender. Two other ingredients are added to the peat in this blender, one is a liquid, and the mixing proceeds through the Upper Continuous Blender and the outflow is considered to be “wet peat”. 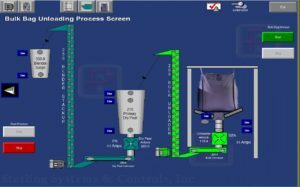 A moisture sensor installed in the Upper Continuous Blender is used to control the amount of liquid added in order to meet a desired moisture setpoint. Wet Peat drys during retention in this second blender and is further mixed. Output of the dry peat from the Retention Blender is sent to the Sifter where the final Peat product is separated from material to be discarded. The final Peat is fed out of the Sifter by a vibratory feeder and delivered to the packaging area. The final packaging area for the Peat product can be either a small bag filler or a bulk bag filling station. 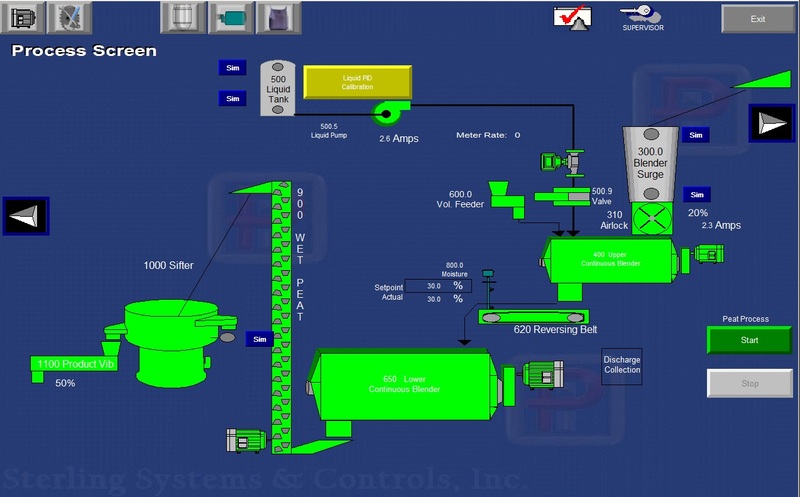 Screen mounted in a control panel running a Sterling Systems & Controls custom designed RSView ME application. 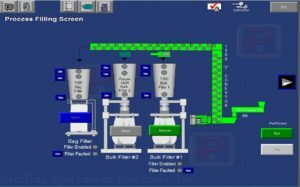 The PanelView Plus 7 interface provides all control, data storage, and equipment status information necessary to run the continuous mixing process.